Everlasting Life Restaurant & Lounge is not just a restaurant, it is a movement. 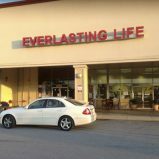 Located in a strip mall surrounded by fast food restaurants, Everlasting Life stands out as a beacon of hope to a sick and obese community drowning in a sea of poor dietary habits. Everlasting Life is a cafeteria-style restaurant offering fresh salads, whole plant-based entrees and side dishes, vegan desserts, juices and smoothies. 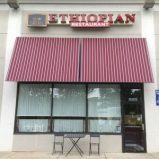 Sheba’s Ethiopian Restaurant is the most elegant of the D.C. area Ethiopian restaurants we visited. Sheba’s boasts a freshly restored dining room with orderly tables bedecked with white tablecloths and prices that are beyond reasonable. The owners are Azeb Gide and her husband Million Hundessa, who Azeb proclaims to be a gifted cook. Her talented but camera-shy chef, Adanech Hussen, assisted in preparing the spicy red lentil dish for our video. 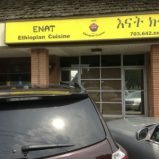 Ethiopian Cuisine is a sure-fire way to find healthy vegan foods on the road. 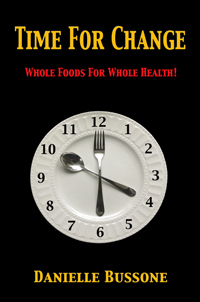 There are 180 religious days of fasting in Ethiopia, in which no animal products of any kind can be eaten, and many personal fasting days relating to prayer and the death of loved ones means that some Ethiopians will fast up to 300 days in a year. The cuisine lends itself beautifully to a whole foods plant-based diet. It consists of a variety of vegetable stews imbued with a unique savory blend of Ethiopian spices called Berberé. The flavors range from highly spiced red lentils to a dish of very mild carrots and cabbage stewed just to the point that the natural sweetness of the vegetables shine, contrasting with and at the same time complimenting the flavors of the surrounding dishes. The stews, or Wat, arrive arranged in a circle on a platter topped with injera, a slightly sour spongy flat bread which is a staple in Ethiopia. 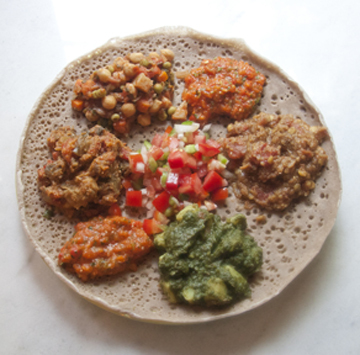 Injera is made of an African whole grain called Teff, which is high in iron and other nutrients. In the US there seems to be some problem getting the traditional mixture to rise properly and form the little holes, or “eyes,” in the thin pancake which give it its spongy texture. Therefore, Teff is mixed with other grains such as buckwheat and spelt to give it the texture of authentic Ethiopian injera without the loss of flavor or nutrition. 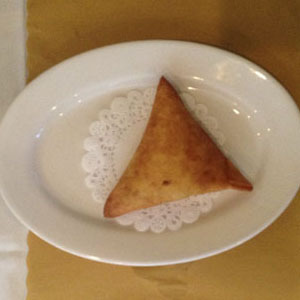 Another piece of injera, usually rolled up in a kind of tubular shape, is served on the side. Utensils are not a part of the Ethiopian dining experience. To eat the stews, one must tear off a piece of the injera, place it over a portion of the stew and pinch the stew within the bread. Then just pop it into your mouth. What a liberating experience! When the side of injera is completed, then you begin eating the injera on your plate. Permeated with the juices of the stew it is often considered the best part of the meal.